I was at the 2015 Workers Capital Conference yesterday, meeting with union pension negotiators and trustees from across the world. There is great best practice that we need to learn from, but also recognise that funds are invested internationally. We are investing in each other’s communities and economies. Pension funds own half of the assets in the world and we should act collectively. The first session looked at the role of trustees and shareholder activism. The Californian teachers pension fund had some good advice for union pension trustees. They distilled these into seven effective ways of working. No place for fear. Don’t be intimidated by the experts and hand over your fiduciary duty to the ‘money people’. Stay curious. Be inquisitive and don’t be afraid to ask questions. Listen first. Speak less and listen more. Intervene at the right moment, don’t just follow the money managers. The Dutch pension fund ABP talked about shareholder activism. Examples included tackling poor labour conditions for textile workers in Bangladesh and Burma. Lack of safety standards and resolving the ‘leukaemia dispute’ at Samsung. Anti-union practices at Walmart. The latter resulted in four years of work before divesting. Their strategy involves intense dialogue, asking key questions and site visits. Sanctions included voted against directors remuneration and finally divestment, but only when all else fails. All of this is much more robust than the sort of ESG engagement advisors in Scotland pursue. While there were different views on priorities, there were some common issues. Infrastructure investment to boost the economy (but not PPP), climate change and workers rights are probably the three main ones and there was support for some broad common goals. Pension funds are long term investors and there was an interesting debate about the pace of change funds should expect from the companies they invest in. Fiduciary duty shouldn’t be a barrier to achieving common union goals. Unsurprisingly, commercial asset managers in the UK resist this approach – even those who can do it in The Netherlands, because they have to! There is no good reason for telling us what something costs – if they can’t tell you don’t buy their services! A lot of these issues appear complex to the average union trustee. But the value of today’s conference is the sharing of information and developing common approaches. 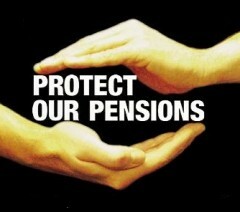 There are few more important issues than our member’s pensions and there is much to do. Posted in: Older People, Pensions, Politics, Social Affairs.